Let Arrow Building Center Design and Drafting Services bring your ideas to life! Our design and drafting team can help you renovate that outdated kitchen, bathroom, or garage, add the three-season sun porch you’ve always wanted, finish off the basement, or make your dream cabin a reality. We provide our customers with design solutions for custom homes, cabins, garages, screen porches and decks; from agricultural buildings and pole buildings, light commercial work to multi-family structures, and everything in between. Let us help you plan your new room, deck or ideal outdoor sanctuary! 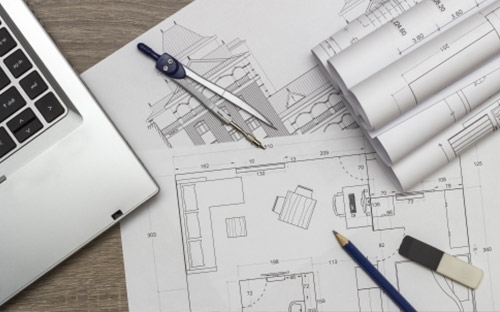 Our many drafting and design services include interior space planning and remodeling, residential and commercial handicap accessibility design, Green Build design, heat-loss calculations, wall bracing, structural beam analysis, and on-site field measuring and consultation. We provide homeowners and contractors accurate and timely blue prints, plans, drawings, and the necessary documents for material estimates, building permits, and actual construction process. G E T S T A R T E D . . .
Find a list of our locations here. At Arrow Building Center it’s all about delivering outstanding drafting & design services to customers in MN & WI. That starts with listening to what our clients want in their proposed project and working with them to create the design that fits their needs. Our hands-on approach provides an engaging and rewarding experience that is focused on delivering acomplete set of working drawings while being considerate of the customer’s budget and goals. PRE-DESIGN MEETING- Initial consultation; we’ll discuss ideas & plan the basic structure of what you desire and the style of home that best suits your lifestyle. The initial meeting will take place at our office or your building site (if it is a remodel project) to discuss style, orientation, functionality, and overall floor plan size. We will go through our ‘Drafting and Design Service Worksheet’ to give you an estimate of what the design service will cost *A 50% down payment of the estimated drawing cost is required to proceed to the preliminary drawing stage. PRELIMINARY DRAWING- Once your initial specifications are identified, we will draft a floor plan with minimal dimensions and front elevation of the project. DESIGN REVIEW- Review the design's room sizes, and over-all layout. Discuss any revisions that you would like to have made. PLAN REVISIONS- If there are any changes that need to be made, we will revise the plan to achieve exactly what was discussed in the Design Review. (Up to 3 preliminary plans may be issued. After 3 revisions, an hourly drafting rate will be charged). 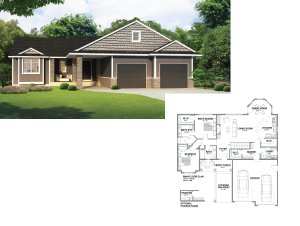 CHECK SET DRAWINGS- The remaining side views of the house and floor plans are created for review, prior to finalizing the design plan. FINAL DRAWINGS- Finishing touches are added to make your plan ready for permit and construction. The final plan includes basement, floor plans, elevations, typical section, beam/header sizing and calculations. Site plans are drafted as needed. 4 sets of the final plans will be included. By partnering closely with Arrow Building Center's experienced sales people and trusted vendors, our Design and Drafting Team have a competitive edge by knowing where and how materials can and should be used. They have the unique opportunity to work with and learn from industry experts about engineered lumber, pre-engineered trusses, rafters, I-joists, and countless other products that affect the design of a structure. Combining our design solutions with extensive product knowledge and accurate in-house estimates allows us to offer our customers the best products that suit their individual project at competitive pricing. For creative solutions that meet your designing challenges, please visit any of our Arrow Building Centers, or contact your local Arrow Building Center yard manager or sales representative for further details on any of our professional services.